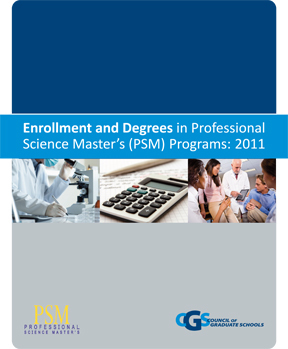 The 2011 Professional Science Master’s Enrollment and Degrees Survey collects data on overall enrollment and degrees awarded in Professional Science Master’s (PSM) programs. It is the second such survey conducted by the Council of Graduate Schools (CGS) with a grant from the Alfred P. Sloan Foundation. PSM program directors and graduate deans (or equivalent) representing 241 PSM programs from 111 institutions of higher education were invited to provide data regarding the number of applications received for admission for the fall term of 2011, the number of applications accepted for the fall term of 2011, the number of first-time enrollees for the fall term of 2011, the total number of enrollees for the fall term of 2011, and the number of degrees awarded during the 2010/11 academic year (July 1, 2010 to June 30, 2011). The survey generated 230 usable responses, for a 95% response rate. Of these, 212 reported students who were either enrolled in a PSM program in the fall term of 2011 or graduated from a PSM program during the 2010/11 academic year.